A growing body of research shows that exercise can be an effective adjunct treatment for depression. As a social work student, Amy Park (a pseudonym) often brought gym clothes to her field placement so she could get in a run before heading home. This tactic may sound familiar to many individuals seeking to fit exercise into their overscheduled lives. Park, however, had additional motivation for completing regular workouts: keeping her depression in check. Diagnosed with severe depression in her late teens, Park remembers thinking that something as simple as running or lifting weights would not lessen her daily challenges with the condition. “In my mind, there was such a thing as being too depressed for exercise since very basic things at that time, like eating and bathing, were a real struggle,” she says. But after using a behavioral activation workbook to track the level of satisfaction she felt from daily activities, Park discovered she consistently felt better after working out. Nearly a decade later, she continues to view exercise as an integral part of her treatment strategy. But Park cautions that people should not view physical activity as a panacea. “Personally, I find it most helpful as a temporary mood boost that gives me the short-term motivation to engage in productive activities that help me get unstuck and move toward things I value,” she says. Depression, in its multiple forms, affects millions of adults in the United States each year. According to the Substance Abuse and Mental Health Services Administration, 14.3 million adults reported at least one major depressive episode in 2008 that affected their ability to work, sleep, eat, or enjoy once-pleasurable activities. In 2005, the Archives of General Psychiatry reported that in any given year, approximately 5.7 million adults experience bipolar disorder in which they fluctuate between mania and depression. Dysthymic disorder, a chronic, milder form of depression, affects around 3.3 million adults annually. These numbers do not account for individuals experiencing symptoms related to postpartum depression, seasonal affective disorder, or more moderate forms of depression. Many people also experience the lethargy, lack of interest in daily activities, and sadness associated with depression without receiving a formal diagnosis. While the statistics are imperfect, they begin to convey the scope of depression and its impact on society. They also set the stage for exercise as an accessible and cost-effective tool that social workers can leverage to help clients battle their symptoms. Since the early 1900s, researchers have published more than 100 studies examining the relationship between exercise and depression or anxiety. National attention increased in 1999 when the Centers for Disease Control and Prevention reviewed the literature examining the impact of exercise on mental health. The report concluded that physical activity appeared to relieve symptoms of depression and anxiety while boosting mood. It also called for further clinical research to examine the role of exercise in preventing depression. Following this somewhat weak endorsement, Daniel Landers, PhD, a professor emeritus from the department of kinesiology at Arizona State University, compared five meta-analytic reviews of the exercise-depression research. His analysis showed a consistent relationship between exercise and moderate reductions in depression across subjects’ age, gender, and depression type. According to Landers (1999), symptoms subsided regardless of the frequency of physical activity, with antidepressant effects beginning as early as the first session. The literature has also revealed similarities in symptom reduction for multiple types of exercise. Most research has focused on common physical activities such as running, walking, and strength training, but relaxation-focused activities such as yoga and breathing exercises are increasingly being studied. Perhaps one of the more heated areas of debate is whether exercise should replace, rather than supplement, common approaches for treating depression. James Blumenthal, PhD, who teaches psychology and neuroscience at Duke University, has taken particular interest in studying whether physical activity can prove as effective as antidepressant medications in managing depression. In 2007, Blumenthal and his research team published results from a study in which they randomly assigned participants to one of four treatment approaches: home-based exercise, group exercise, antidepressant medication, or a placebo. All 202 participants had been diagnosed with major depressive disorder and had completed their respective treatments for 16 weeks. While all three treatment options proved more effective than the placebo, remission rates among the home-based and group exercise cohorts were not statistically different from remission rates among the group taking antidepressants (Blumenthal et al., 2007). This study reaffirmed the results of earlier research involving 156 adults aged 50 or older with major depressive disorder (Blumenthal et al., 1999). From a practitioner perspective, Chmielinski emphasizes the importance of consulting with a client’s physician or psychiatrist regarding a possible medication change, regardless of findings such as Blumenthal’s. ”I wouldn’t recommend a client start or stop a medication outside of the context of the physician’s direction,” she says. Despite growing clinical evidence suggesting that exercise can reduce symptoms of depression, scientists still struggle to determine what causes these changes in humans. Several hypotheses have emerged. One of the most common theories focuses on serotonin, a neurotransmitter responsible for sending impulses across the brain. Researchers have established that individuals experiencing depression tend to have lower levels of serotonin in their blood. The same is true for the neurotransmitter norepinephrine. Many antidepressant medications, such as Prozac, Zoloft, Effexor, and Cymbalta, seek to increase the amount of these neurotransmitters outside human cells with the aim of better regulating outcomes such as mood and sleep. The National Institute of Mental Health (NIMH) has also explored the neurological connection in animals between physical activity and psychosocial stress, which can lead to behavior mimicking depression. In 2010, NIMH research showed that laboratory mice living in environments that allowed for exercise and exploration responded better to bullying from other mice than rodents living in more basic settings (Schloesser, Lehmann, Martinowich, Manji, & Herkenham, 2010). A later study re-creating this experiment found that mice living in enriched environments also contained signs of increased neuron activity in a portion of the brain known as the infralimbic cortex. According to the NIMH report, the inframlimbic cortex is responsible for activating nearby parts of the brain and may contribute to how animals, and potentially humans, respond to fear and stress (Lehmann & Herkenham, 2011). While scientists continue examining the biological and chemical effects of exercise on depression, it is also important for social workers to consider its potential psychological effects. Michael Otto, PhD, a psychology professor at Boston University, believes that more emphasis should be placed on the nearly immediate impact of exercise on mood. He claims that most mood benefits occur within five minutes of exercise, although they can be delayed for up to 30 minutes following more intense activity. Otto, who specializes in the cognitive-behavioral treatment of mood and anxiety disorders, advises social workers to suggest incremental changes to clients’ exercise habits to make them seem more manageable. Examples include placing a pair of tennis shoes by the front door or ending workouts on a positive note to instill a happy association with physical activity. More recommendations are included in Exercise for Mood and Anxiety: Proven Strategies for Overcoming Depression and Enhancing Well-Being, a book authored by Otto and colleague Jasper Smits, PhD. In keeping with Otto’s emphasis on positivity, laughter yoga has emerged as a growing exercise practice promoting the physical and psychological benefits of laughter. While some laughter-based activities involve a lot of movement, programs can be adjusted to accommodate those with physical or cognitive limitations. Diamond adds that individuals do not need to be in a good mood or even have a sense of humor to benefit from the practice. Indeed, one of the key laughter yoga mantras is to “fake it until you make it,” referring to the real laughter that often emerges from an initially forced response. Meeting an exercise goal can also affect clients’ sense of accomplishment and fulfillment, potentially leading to an improved psychological state. This argument resonates strongly with Park, who claims that exercise helped shift her focus to a specific goal and its outcome rather than how she was feeling that day. “Exercise is one of those things that can very easily give you a sense of mastery of your environment, which can easily carry over into other aspects of your life,” she says. With so many questions about exercise and depression unanswered, it may seem difficult for social workers to find their role in the equation. But according to Chmielinski, who sees many of her clients on a weekly basis, social workers and therapists are in an ideal position to promote change because of the continuity of their relationship and therapeutic rapport. “How often do you see your doctor every week?” she asks. 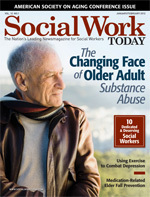 Common social work approaches, such as the person-in-environment theory, also come into play. Camielle Call, LCSW, who runs a private consultation practice in Sitka, AK, recalls working with a client who reported decreased enjoyment in daily activities. Although the symptoms appeared to be triggered by southeast Alaska’s continuous cloud cover, Call says the client ultimately benefited from living in a community where she saw people exercising outside. “Seeing people maintaining their physical health by walking with friends, being active with their children, or walking their dogs helped her mindset get to a place where she could say, ‘That’s what I can do to help myself get better.’ She wanted to be a part of that healthy environment,” Call says. Social workers can also use a strengths-based approach to help clients overcome resistance to physical activity. Call describes another client whose extended family made him feel uncomfortable seeking help for his chronic depressive episodes. Call focused on the client’s strengths as a father to create a treatment plan that included family-building activities based around exercise. Otto encourages social workers to remember the “doing parts of therapy,” such as developing workout recommendations for clients medically cleared to exercise. Taking this step, however, does not have to include a trip to the gym. For example, practitioners can learn the rated perceived exertion scale (a simple scale used by coaches to rate athletes’ exercise) to help clients measure the intensity of their workouts. Pedometers are another simple way to make people more aware of their daily behaviors. Additionally, social workers can identify and provide resources to help clients incorporate physical activity into their lives. Donna Ulteig, LCSW, of Psychiatric Services SC in Madison, WI, remembers a client who experienced pain as she exercised. Ulteig responded to this challenge by identifying a nearby exercise class held in a warm-water pool and helping her client find a swimsuit. Ulteig notes the importance of alternative reward systems for clients who may need additional encouragement. Rewards can be self-induced, such as a person allowing himself or herself to make a small purchase after a workout. Alternatively, social workers can identify external motivators such as friends or family members who can craft customized ideas for positive reinforcement. Ideas include family or friends going to a movie the client wants to see or offering to cook dinner if he or she completes a workout. As for Park, who recently received her master’s degree in social work, she wishes her own therapist had provided tips to keep her motivated. She sees the benefit in guiding clients through their feelings as they experience both the sense of improvement and plateau often associated with exercise. Park adds that guiding clients through their emotional response to exercise helps the social worker ensure they are supporting but not forcing the treatment. Ultimately, the decision to incorporate physical activity into a broader treatment plan should remain in clients’ hands. “There is a fine line between encouragement and pressuring somebody to do something they don’t want to do,” says Park. — Joelle Ruben, MSW, LSW, is a Harrisburg, PA-based freelance writer. • Couch to 5K (www.c25k.com): The Couch-to-5K running plan provides timed running schedules to help beginners train for 5Ks in just over two months. The website links to podcasts and smartphone apps that help users know when to alternate between walking and running. • FitLink (www.fitlink.com/workouts): FitLink is an interactive website that lets members post workouts and running/walking routes and search for workout partners by zip code. There is also a search function for personal trainers and other fitness professionals. • Laughter Yoga International (www.laughteryoga.org): The official website of Dr. Madan Kataria provides information on laughter yoga and related research, including a section on laughter yoga and depression. Additionally, the site provides contact information for laughter yoga clubs around the world. • SparkPeople (www.sparkpeople.com): SparkPeople is an online healthy-living community that allows users to create customized exercise plans, post to message boards monitored by experts, and learn about common health conditions. Users can join specific SparkTeams, including several focused on dealing with depression. Blumenthal, J. A., Babyak, M. A., Doraiswamy, P. M., Watkins, L., Hoffman, B. M., Barbour, K. A., et al. (2007). Exercise and pharmacotherapy in the treatment of major depressive disorder. Psychosomatic Medicine, 69(7), 587-596. Blumenthal, J. A., Babyak, M. A., Moore, K. A., Craighead, W. E., Herman, S., Khatri, P., et al. (1999). Effects of exercise training on older patients with major depression. Archives of Internal Medicine, 159(19), 2349-2356. Landers, D. M. (1999). The influence of exercise on mental health. In C.B. Corbin & R.P. Pangrazi (Eds. ), Toward a better understanding of physical fitness & activity. (pp. 137-143) Scottsdale, AZ: Holcomb Hathaway. Lehmann, M. I., & Herkenham, M. Environmental enrichment confers stress resiliency to social defeat through an infralimbic cortex-dependent neuroanatomical pathway. (2011). Journal of Neuroscience, 31(16), 6159-6173. Schloesser, R. J., Lehmann, M., Martinowich, K., Manji, H. K., & Herkenham, M. (2010). Environmental enrichment requires adult neurogenesis to facilitate recovery from psychosocial stress. Molecular Psychiatry, 15(12), 1152-1163.